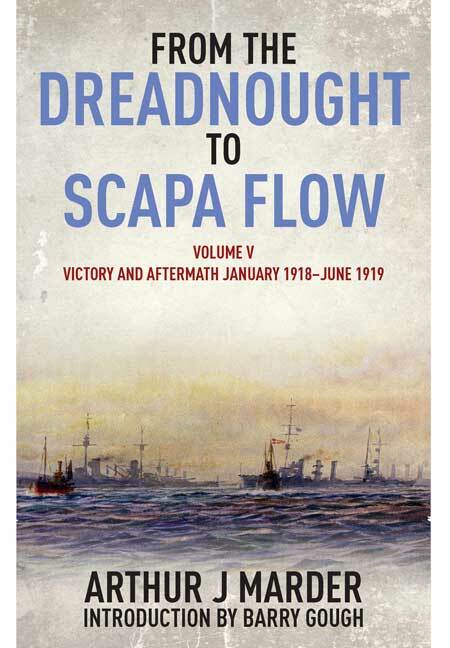 You'll be £16.99 closer to your next £10.00 credit when you purchase From the Dreadnought to Scapa Flow Volume V. What's this? The five volumes were subtitled The Royal Navy in the Fisher Era, 1904–1919 and they are still, despite recent major contributions from Robert Massie and Andrew Gordan, regarded by many as the definitive history of naval events leading up to and including the Great War. This last volume describes the Royal Navy's final triumph. The convoy system brought rewards and the US Navy arrived in European waters. The striking 1918 raid on Zeebrugge was a big morale booster, and in November 1918 Beatty received the surrender of the German High Seas Fleet. In June the following year the Germand scuttled their fleet at Scapa Flow and so came to an end a major era in naval history. A new introduction by Barry Gough, the distinguished Canadian maritime and naval historian, assesses the importance of Marder's work and anchors it firmly amongst the great naval narrative histories of this era. This new paperback edition will bring a truly great work to a new generation of historians and general readers. Volume Five, 1918-1919 Victory and Aftermath, concludes Marder’s magnum opus. Major naval actions were few; however, the heroic Zeebrugge operation is a stand-out. Marder examines the ‘second-line’ operations such as the Dover Strait and Northern barrages and the U-boat battle, largely defused by the introduction of convoy. By this time the British and German battle fleets were seemingly at a loose end; the British yearning for another, this time conclusive, fleet action and the German fleet swinging around its buoys in idleness and subsequent mutiny while the new generation of naval weapons systems – U-boats – maintained the German maritime rage. The volume concludes with the ‘Rifts and Reforms’ at the Admiralty with changes of commands and appointments, Beatty’s elevation to First Sea Lord and ‘Uncertainties and New Rivalries’. ‘From the Dreadnought to Scapa Flow’ concludes with the armistice and surrender of the German fleet and ‘Reflections On the Era’. Volume Five contains the bibliography, which runs to 54 pages. Marder had the advantage of access to the papers and of personal interaction with many of the RN’s senior officers of the period and access to Admiralty files and records; itself a saga of Marder’s relentless determination to mine this priceless resource in the face of initial British bureaucrat obfuscation (covered in the abovementioned ‘Historical Dreadnoughts’). Click hereto read the full review. Remains a stunning work of scholarship and naval history. Marder writes beautifully, insightfully and fairly. Should still be on the bookshelf of anyone with interest in the Royal Navy in WW1. [An] extensive and masterly classic work of the Royal Navy in the Great War. A prodigious work of scholarship which provides a thorough comprehensive history of naval plans, policy and naval operations throughout the war. For any serious study of the naval side of the First World War these volumes are invaluable and most strongly recommended. The five volumes that constitute Arthur Marder's 'From the Dreadnought to Scapa Flow' represent arguably amongst the finest contributions to the literature of naval history...and are still regarded by many as the definitive history of naval events leading up to and including the First World War. This outstanding work, which has withstood the passage of time, is a first class read and deserves to be in the library of all those interested in naval history. Highly recommended.